Your Nikon D3100 DSLR offers eight fully automatic exposure modes for picture taking that you can change with the Mode dial. Your options are Auto (a general purpose, point-and-shoot type of option), Auto Flash Off (the same thing as Auto but without flash), and six Scene modes made to suit specific situations. Release mode: Sets the number of photos snapped with each press of the shutter button and the timing of each picture. Single: Records a single picture immediately when you press the shutter button fully. Continuous: Records up to three frames per second when the shutter button is held down. Self-Timer: Captures the image a few seconds after you press the shutter button, enabling the photographer to step from behind the camera and into the shot. Quiet: Works like Single mode but silences the camera’s normal operating sounds as much as possible. Focusing: You can enjoy autofocusing, if your lens supports it, or focus manually. Vibration Reduction: When enabled, this feature counteracts camera movement caused by handholding the camera and maintains desirable sharpness. On the kit lens, turn Vibration Reduction on or off via the VR switch. Flash: The camera won’t flash in Sports, Landscape, and Flash Off modes. 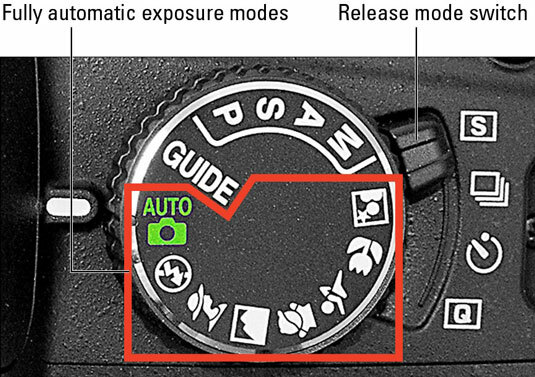 In the other modes, you can choose from a few Flash modes. The default Flash mode is Auto, which engages the built-in flash when additional light is necessary. Image Quality and Image Size: The default size of photos taken with the Nikon D3100 is the Large Image Size setting, 14.2 MP (megapixel), and the Normal Image Quality, which gives the JPEG picture file with a moderate amount of compression. Exposure: The exposure-adjustment option available in Scene Modes, ISO Sensitivity, determines how much light is needed to expose the image. Auto Distortion Control: Tries to compensate for the distortion that appears when you shoot with wide-angle or extreme telephoto lenses. Color Space: Stick with the default setting, sRGB, until you are more familiar with color issues. Noise Reduction: Attempts to correct image defects that appear when using a high ISO setting or a long exposure time.